The versatile actor will be seen next as a gangster in Karthik Subbaraj’s Jigarthanda, starring Siddharth and Lakshmi Menon. 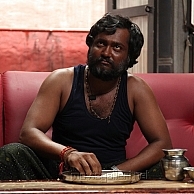 He also plays the lead – a man searching for a job - in Urumeen, directed by Sakthivel Perumalsamy. People looking for online information on Jigarthanda, Simhaa will find this news story useful.